the scent of green bananas: baking by the bushel. Posted by santos. This entry was posted on 20071217 at 3:59 PM You can skip to the end and leave a response. I have this book and have been dying to make these cookies. Sounds like they're worth it, eh? dana, happy holidays! i like this book a lot. this is the first time i've made from it, and yes, if you like oatmeal and raisins, it is. i've been baking waaay too much these days for someone who's not much into baking & sweets. 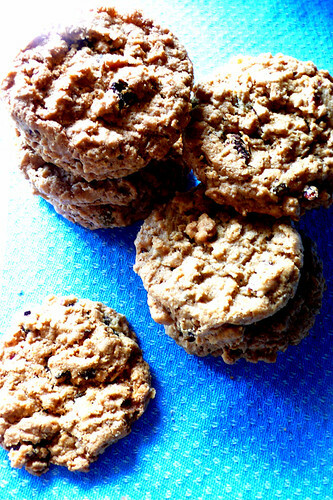 i made pb oatmeal chocolate chip cookies today. oatmeal doesn't look like much but i like that it's identifiable. the bad thing with all this baking is my waistline. can't stop tasting everything! :) happy holidays santos!